My wife Simone and I have just completed 4 very worthwhile and enjoyable weeks learning how to speak and write Hebrew while living in Ramat Yishay, Israel with our teacher, Shlomit, and her family. While still in the United States, we studied quite hard with Rosetta Stone and Pimsleur tapes. However, when we finally found ourselves back in Israel, we really did not know enough Hebrew for it to be of any use, and we actually started forgetting what we had learned because we always had to fall back on our English. This definitely has not been the case with Home Ulpan, a unique educational concept for Israel, that incorporates a Bed and Breakfast/Home stay with intensive Hebrew language study. Shlomit is a superb teacher, and this is no accident. She is a native Israeli with a university degree in both Hebrew and Arabic and she has over 20 years teaching experience, both at the university level and to beginning students. She has put together an extremely effective curriculum. The course includes reading, writing and speaking Hebrew, with all the facets being coordinated with each other in a fun and effective way. It is fast paced learning, but Shlomit is very attentive to the individual student’s strengths and weaknesses, and she adapts the coursework accordingly. She utilizes a variety of teaching tools, including songs and field trips along with more standard methods. Ramat Yishay is a very nice small town in the beautiful Jezreel valley, one of Israel’s agricultural centers. The home, as well as the entire neighborhood, is very nice and comfortable, sits directly on the edge of beautiful farm land. 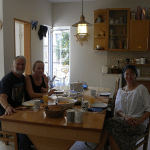 A bountiful, excellent home made Israeli style breakfast is served every day. Meals always include some great tastes from the family garden such as lemongrass tea and home made fruit jams. Students and family eat and live together. The entire family is friendly and interesting and are a great addition to the experience. Simone and I had our own room and our own, very nice bathroom next to it. Most importantly, we have been astonished at how much Hebrew we have learned. After 2 weeks of class we were so impressed, that we changed our airline tickets so that we could study an additional 2 weeks. Sadly, we must now finally return home, but Shlomit has given us plenty of study materials to take home. Our plan is to keep up on the work at home and hopefully return for more Home Ulpan this Spring. If you are looking for a unique, fun and effective way to learn Hebrew, you should definitely look into Home Ulpan! (But don’t take our spot!) Gary Dandy M.D. November 30, 2012.